The president is set to rally in the hometown of his likely 2020 rival — and O’Rourke plans to hit back at a protest of his own. EL PASO, Texas — The showdown between Donald Trump and Beto O’Rourke over the president’s border wall is about to get real. The president was en route to O’Rourke’s hometown Monday for a campaign rally touting his long-sought wall. But O’Rourke is set to headline a counter-rally at a sports complex across the street, setting the stage for the first in-person clash of 2020 between Trump and a potential Democratic rival. The call-and-response in Washington and West Texas crystallized the partisan battle over immigration even before Trump landed in this border city. Staring down a potential second government shutdown over border security, Trump picked this heavily Democratic and Latino region to redouble his call for a border wall, an issue that propelled him to the presidency and remains at the center of his reelection campaign. Yet when Trump touches down here, it will mark the most direct, real-time clash yet between Trump and a 2020 Democratic contender. 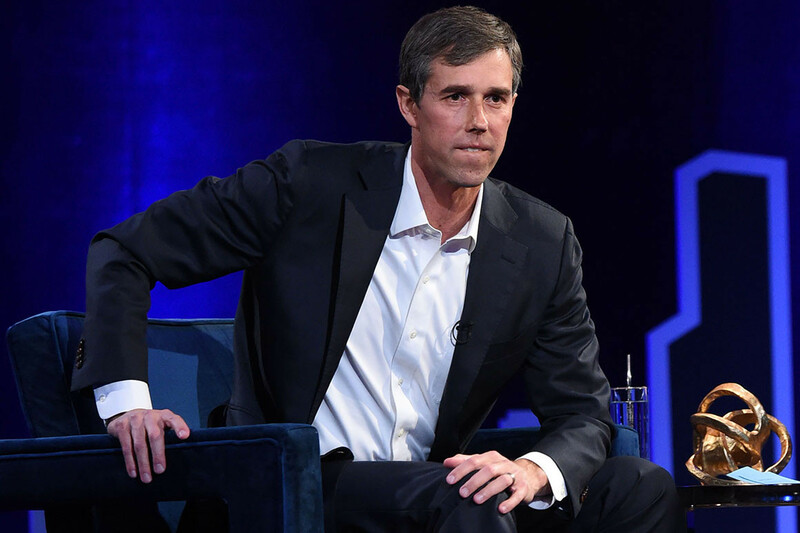 O’Rourke, a former congressman, would join the top tier of Democratic presidential candidates if he decides to run. The location of the dueling rallies appeared destined to inflame controversy. A city of about 680,000 people, El Paso is a Democratic oasis in a heavily Republican state — closer geographically to the California state line than to San Antonio or Houston. More than 80 percent of the population in El Paso County is Hispanic, and Trump is so deeply unpopular here that in 2016, he won just 26 percent of the county’s vote. O’Rourke, meanwhile, has made immigration a central part of his platform following his closer-than-expected loss to Republican Ted Cruz in last year’s Texas Senate race. Before the counter-rally against Trump, O’Rourke drew publicity for walking across the border form El Paso to Juarez to meet with asylum seekers and for visiting a detention camp for migrant children at Tornillo. On Christmas Eve, he was photographed passing out pizza slices to immigrant children in El Paso. Trump is under pressure across the political spectrum on immigration. His base is demanding money for a border wall, of course. But a majority of voters oppose shutting the government down again to force Congress to appropriate money for a wall, according to recent polls. And declaring a national emergency is no quick fix for Trump; the idea lacks broad support. Trump has dismissed O’Rourke as a “total lightweight,” saying in December that “I thought you were supposed to win before you run for president.” But his singling out of El Paso — first in his State of the Union address, and then on Monday — only increased attention on the former congressman and his city. Trump’s claim that El Paso used to be one of the nation’s most dangerous cities before erecting a barrier has been widely discredited. El Paso has long enjoyed a violent crime rate lower than the national average for cities of similar size, according to PolitiFact, the political fact-checking website. “Even more, the violent crime rate went up — not down, as Trump claimed — after the construction of a border fence in the region,” the site found. The El Paso Times, in its own analysis, came to a similar conclusion after Texas Attorney General Ken Paxton told Trump earlier this year that a fence had reduced crime in El Paso. Preparing for Trump’s visit, local officials in El Paso gathered at a government building downtown on Monday afternoon to decry Trump’s characterization of lawlessness in El Paso before the construction of a fence. Next articleWhat happened to prisoners at Bagram, ‘Afghanistan’s Guantanamo’?